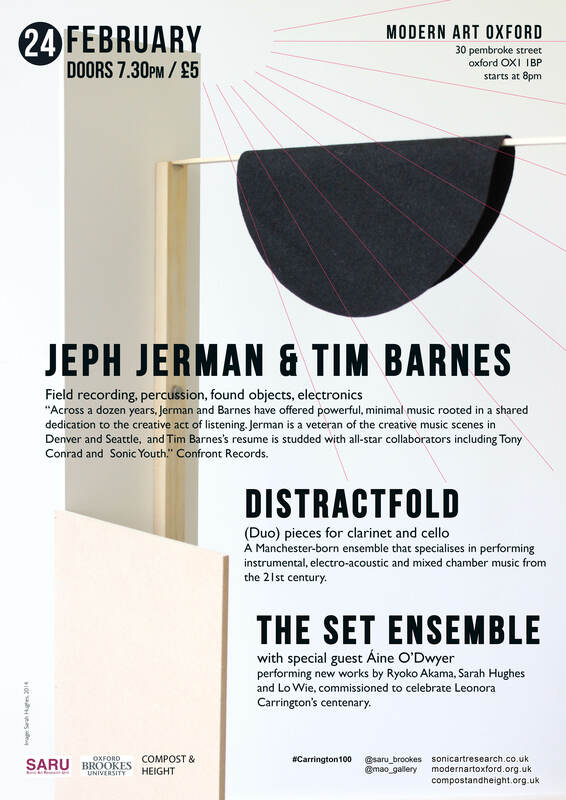 The Set Ensemble will be performing alongside Jeph Jerman & Tim Barnes, and Distractfold at an evening of live music at Modern Art Oxford. Organised by Compost and Height and the Sonic Arts Research Unit, The Set Ensemble will be performing three world premieres by composers Ryogo Akama, Lo Wie and Sarah Hughes. Each of the compositions has been written in response to Leonora Carrington’s novel ‘The Hearing Trumpet’ and have been written the mark the Carrington centenary in 2017. Field recording, percussion, found objects, electronics. Jerman and Barnes offer powerful, minimal music rooted in a shared dedication to the creative act of listening. (duo) pieces for clarinet and cello. A Manchester-born ensemble that specialises in performing instrumental, electro-acoustic and mixed chamber music from the 21st century. Performing new works by Ryoko Akama, Sarah Hughes and Lo Wie, commissioned to celebrate Leonora Carrington’s centenary. Modern Art Oxford, 30 Pembroke Street, Oxford, OX1 1BP.